The Lumpenproletariat, criminals and rascals who are of no economic value. Competition exists both between and within these classes. Between-class and within-class competition exists to establish the terms of trade of these classes within society. While everyday politics can do little to change the terms of trade between classes, it can greatly effect the terms-of-trade within classes. For instance, the Petite Bourgeoisie in the United States is heavily white, but south asians and east asians are disproportionately represented within it. 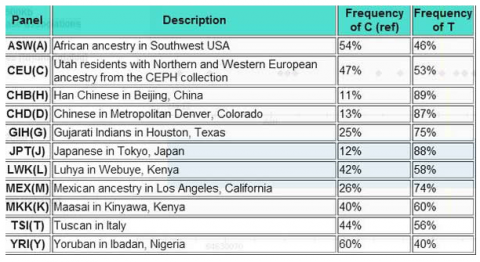 Nonetheless, all asians combined are still a small minority of the Petite, so the Petite BourgeoisieÂ spends most of its efforts on economically pointless cultural conflict (gar marriage, and so on). The Proletariat, is much more diverse. 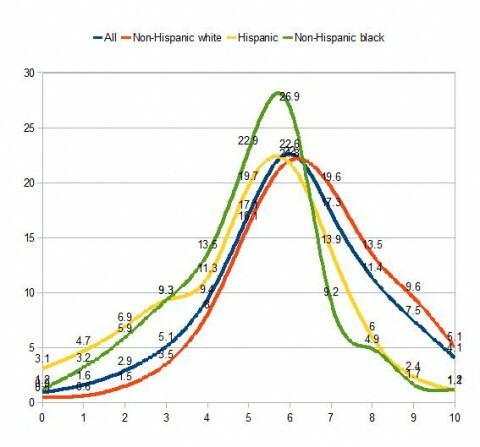 Both blacks and hispanics are disproportionately represented in the proletariat. 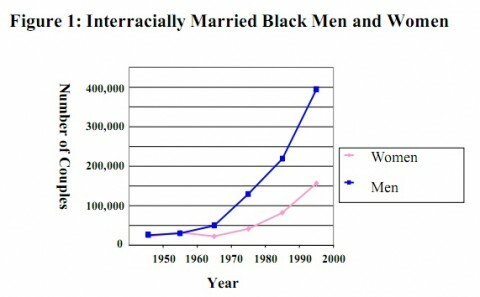 Further, unlike the petite bourgeoisie (where whites are a long-running and stable majority), immigration patterns created by the federal government (“the executive committee of the bourgeoisie” have lead to blacks being displaced as the largest minority in general, and even the largest non-white constituent group of the proletariat, by hispanics. Whites in America really have no idea how hard life can be for blacks. Whites, whose leadership springs firmly from the petite bourgeoisie, are basically secure in their positions. In order to understand the plight of their fellow citizens, it is perhaps wise to imagine a United States in which Asians were already the dominant ethnic group. The art of deciding who gets what is called politics. While political cartels can form among nearly all players in well established political communities, the immense tide of hispanic immigration in recent years means that it is impossible for factions within the proletariat to form a cartel without hispanic hegemony within that class. In the absence of a well established political community, the tools that will be used are democracy and organized violence. Democracy is a useful tool of the popular and numerous. Organized violence is the useful tool of the weak and small. The lynching of George Zimmerman — the hispanic involved in a fatal confrontation with Treyvon Martin — only makes sense in the context of intraclass struggle. Organized violence — such as the eldery man beaten by 6 youths, the police car attacked, the death threats against the Zimmerman household etc — are clearly part of a LIHOP run by Al Sharpton on others to use the only means left at their disposal to save what remains of their hegemony within the proletariat. People are murdered every day in the United States. Nothing’s special about that. No one cares. What is unusual is for anyone to care. And people do care in the case of Mr. Zimmerman. Because lynching a hispanic is way cheaper for the petite bourgeoisie than facing a campaign of organized violence. White petite bourgeoisie were getting hurt. Lynch a hispanic proletarian, and it all goes away. We create a new people. Instead being refugees we we to be fighters. This very important. We were refugees. Harmless. We become now fighters. Freedom fighters. The next stage, you will see…. We live in a world, radically artificial twice over, and we havenâ€™t begun to see what it will hold. This is actually a good point to describe how races may will survive long after any racial difference in intelligence can be imputed through skin color. 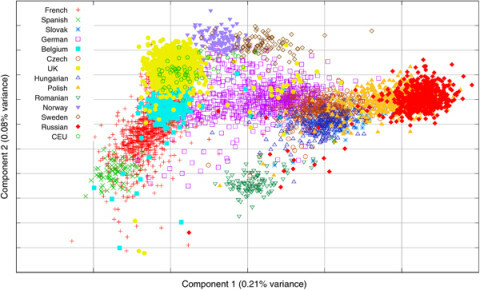 Consider if the C version of the gene really is associated with lower and higher intelligence. If so, it should be a “simple” matter of engineering a retrovirus that would infect an embryo, fetus, or child in the womb in order to direct the DNA to code for one version, instead of the other. Of course, this procedure will have risks, and doubtless be fatal in some cases. Now consider that we’re able to make a retrovirus, fine-tuned to the individual, that could create a 15 point increase in general intelligence (say, the average difference between a 3rd year college drop out and an M.D; or between an average Gentile and an average Jew on a standardized verbal intelligence test), with the slight side-effect that a fourth of all unborn children treated with such a retrovirus will die before birth. No developed society that values its children will engage in such a practice on a wide scale. But a few poor and backwards societies might. Supposedly, Saddam Hussein (in his pre-war days) abolished illiteracy by announcing, a few years in advance, that illiteracy would be a capital crime. Most people got the message. Others got shot. Highly centralized states are able to take large risks. The Chinese experience under Mao and Deng show how very similar leadership styles and personal backgrounds can lead to the greatest elimination of poverty in history (under Deng‘s economic reforms), or the greatest elimination of the poor in history (under Mao‘s autogenocidal policies). Some country we don’t care about too much — perhaps Somaliland or Azawad — is in for a wild 21st century. There would still be Somalis or Azawadis. But they’d be a new people. Last week, John Derbyshire wrote an article on race relations that led to him being removed from the list of contributing writers for National Review Online. Mr. Derbyshire made a series of factual claims, which were correct, and then proceeded to interpret these factual claims to give specific advise on how an individual should comport himself of members of other races. Derbyshire’s column was widely criticized, but I have found only two examples of pieces which criticized the his factual claims, as opposed to his advise in the face of those claims. One was the short piece “By His Own Standards,” by Jason Lee Steorts that I previously discussed. Iâ€™m all for frank talk, and not hiding behind politically-correct shibboleths. But Iâ€™m not for lazy talk, and Iâ€™m not for talk that implies a complete lack of concern for the social costs of oneâ€™s views. People talk of differences in â€œaverages,â€ but this is a misleading way to talk. The difference between the 50th percentile and the 53rd percentile in extroversion, for example, is likely to be barely noticeable. 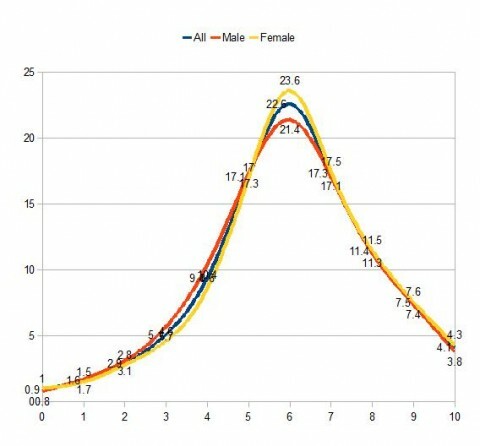 Rather, average differences matter in the extremes. and also in contrast to educational differences in intelligence. 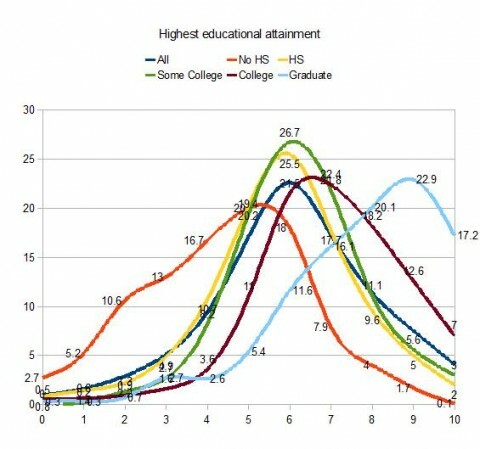 The average intelligence of the highly educated is greatly different from the average intelligence of the non-highly educated. This also shows up in the extremes. And in contrast to Jews, who are highly intelligent compared to other groups. 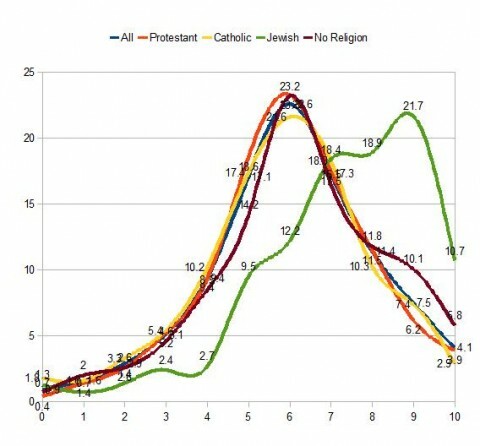 The average intelligence of Jews is greatly different from the average intelligence of non-Jews. This also shows up in the extremes. These charts were created from data in the General Social Survey, using the WORDSUM variable as a a rough-and-ready measure of verbal intelligence. There are much better measures available, but GSS has the advantage of having asked the question to very large numbers of people and being easily accessible from a web browser.